This small, yet entertaining book by Don Goldstein proves scientifically, mathematically, historically, and prophetically that the Hebrew Scriptures are reliable, that God is real, and that He wants to give you the desires of your heart. 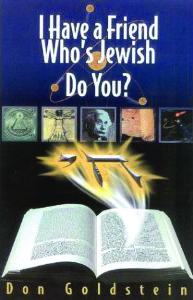 Great for Jewish pre-believers! 71 pgs. 2-BOOK WITNESSING BUNDLE - A Way in the Wilderness and I Have a Friend Who’s Jewish...Do You?